Ristoranti will have different kinds of pizzas on their menus. Most of which are personalized. They put anything on it, eggplant, french fries, lettuce and other leafy vegetables, hotdog, chicken meat and what-have-you’s. 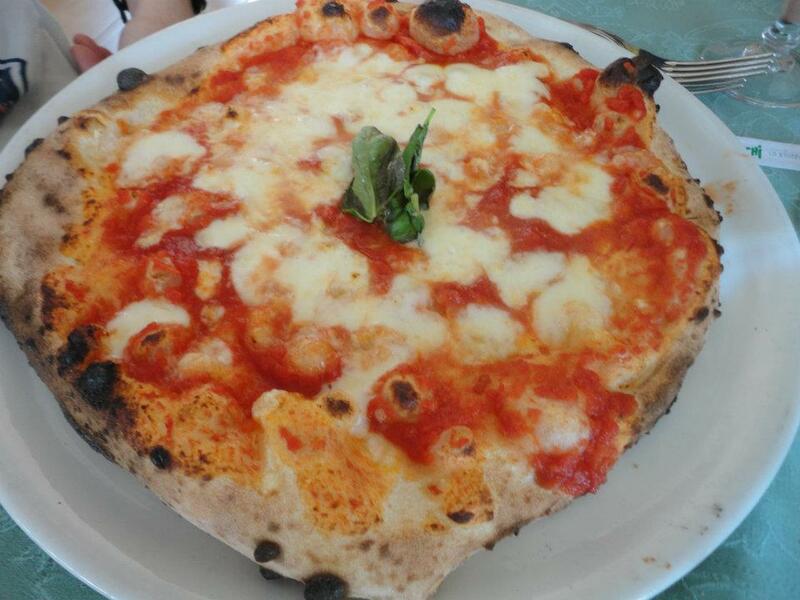 Now in Naples, in all technicalities, there are only two true Neapolitan pizzas. Those are Margherita and Marinara. 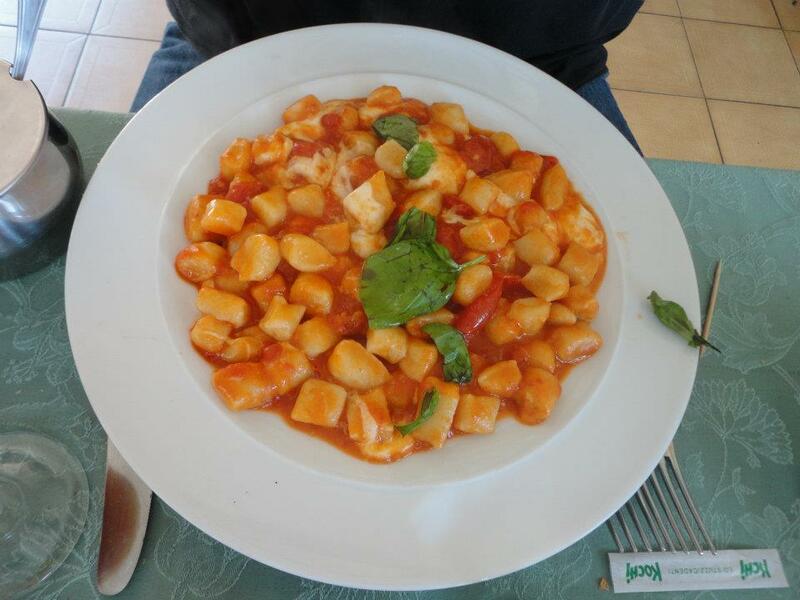 To distinguish from each other, Margherita has the famous mozzarella while Marinara is covered with tomatoes. Even the movie Eat, Pray, Love showed one of these two simple and basic ingredient Neapolitan pizzas. Neapolitans takes pride on their pizzas and will emphasize about these particular two. Naples is known for their production of mozzarella. Now, I have a friend who was excited to tell me about the Italian pizza he had in New York. While I can agree it all good-tasting. I’m sorry to sound condescending and snotty, but I cannot believe it to be Italian unless it is oily and hard to pick up. To which the said pizza was not. As you know, Italians are heavy on olive oil. It’s exactly the same thing with Gelato. I cannot find any real gelato anywhere in other countries other than in Italy. They even have an ice cream in my area where, instead of scoping, they are scraping their ice cream hard because it is frozen. Gelato’s are supposed to be smooth. The texture alone is distinctive and actually makes it even more appealing. Gelaterias are sometimes adjoined with pastieras and cafeterias. I guess cafe is European. Italian looove their cafe. Based on my observation, more than in Spain. It doesn’t matter what time of the day nor where you at. They drink it at home, on their way to work, at work, while working, lunchtime, after work. I wouldn’t be surprised if they drink it in their sleep. That’s exaggerated. What else can you expect, cafeterias are everywhere. Cafe is served in small cups, you drink it like liquor shots. I am a sweet-tooth. When I resided in Italy for 2 years, pastieras became my paradise. I can’t name them all here. Just too many to mention. What I can say is watch out for seasonal-holiday desserts and cuisine. The picture on the right is an Easter Italian pie. Babka, yeast bread, is traditionally baked during Easter Sunday. Chiacchiere is only served during Carnevale season. Struffoli in Naples during Christmas. During Christmas, it’s traditional to eat lightly and meatless as a form of fasting. Also during Easter season, many places in Italy makes lasagna from scratch. 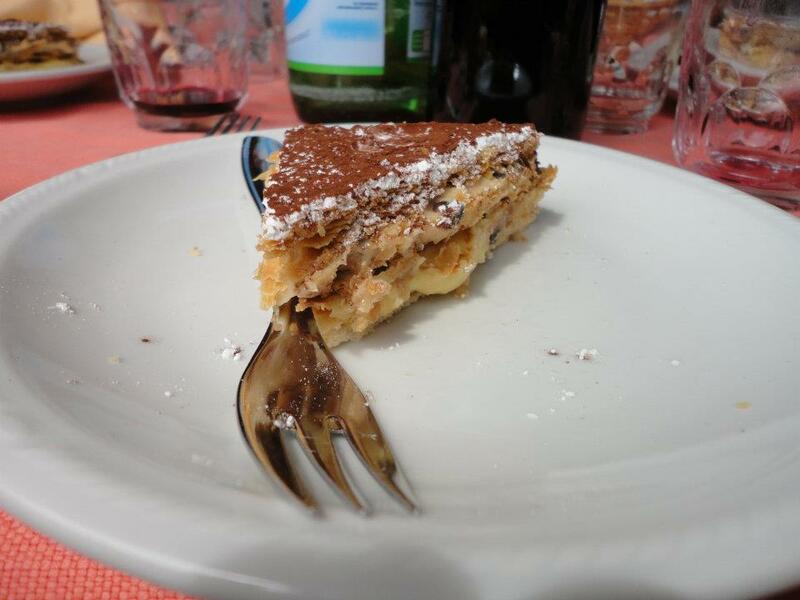 For more Italian pastry, my favorites are tiramisu (of course), Panino Neapolitano and sfogliatelle. I’ll let you explore the other ones. 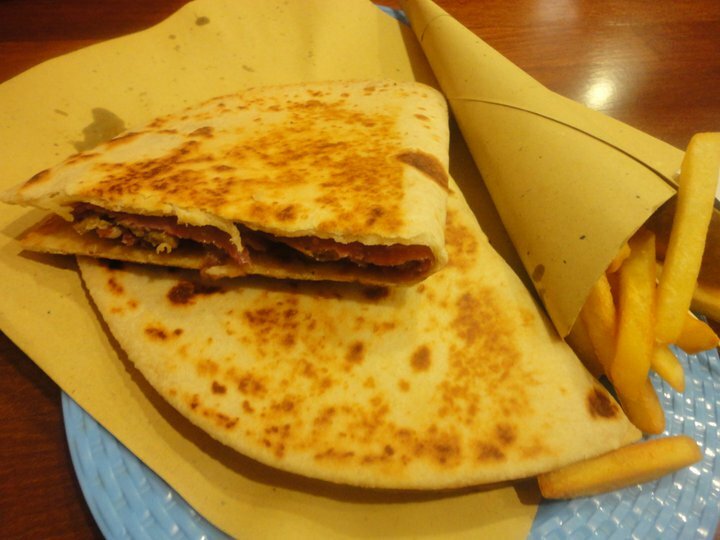 My favorite discovery is Piadina, which is pretty much an Italian-style quesadilla. This is normally served in the Northern part of Italy, mainly in Milan and San Marino. 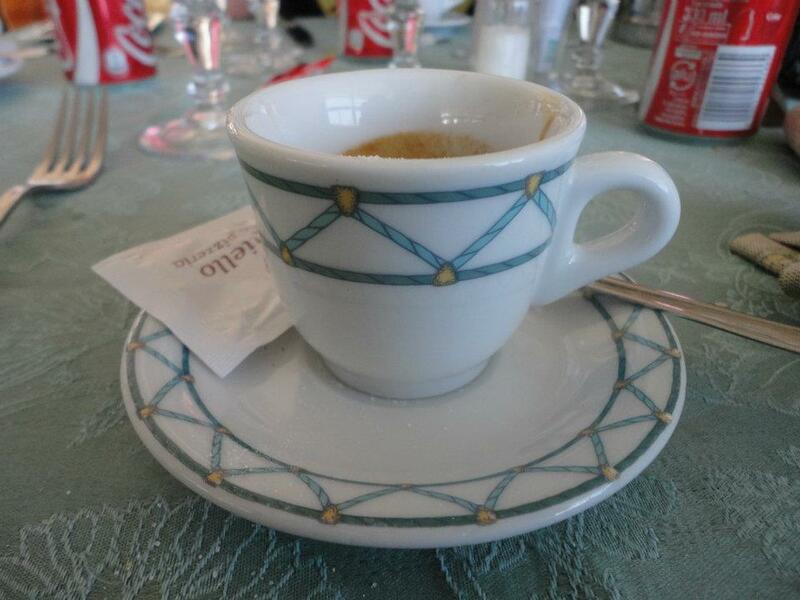 I had this in Caserta, in the region of Campania. Italian fine dining is consist of 5 or more courses. The courses typically consist of antipasto, primo, secondo, contorno and dolce. Others consider adding cafe and fruits and vegetables as courses. I love it when the restaurant gives out plates and plates and plates of antipasti (appetizers) for collective, reasonable prize. Italians are known for their pasta. Ding, ding, ding. My favorite is the usual carbonara. Don’t be surprised when the pasta you are ordering is not the same in one place to another. It’s a plus to a restaurant where you can ask the cameriere whichever ingredients you want in your pasta. Italians always take their time when dining. An already fine meal gets even tastier when you eat with conversations and laughter. I never thought I’d like vino until I came to Italy, granted I went to Spain first for 6 months. I always rejected it. One day, attending a christening, I drank a glass of Moscato as a courtesy to the occasion. The wine may had been a popular one, but lo and behold, I became fond of drinking any wine afterwards. I’d run out of breath if cover it all. Carciofo or Artichokes, you hear it there and there but in Italy, you’ll usually find it in any market. Kebabs, like in any other European countries, are also everywhere. Kebabs in Europe are not on a stick but a wrap. Nutella is the popular spread for panino and other pastries. Not to forget cheese, extra delectable when in Europe. Bruschetta! mainly bread and tomatoes, and together with other stuffs. Saltimbocca is a Romanian veal. The name literally means jump in the mouth. Okay I’m gasping for air. I’m spilling everything already. I’ll end this post with everybody’s favorite, Gnocchi. No contest, no argument. It’s a must for every one who comes in Italy. This taste of heaven poses like a pasta. It is actually made of potatoes. Want to know more of Italy? Check out Bagni di Lucca’s blog. Plain and simple Everything you need to know is there … and then some. I’ve never heard of Gelato, but it sure does look good. If it is anything remotely like icecream, I’m sure I’d love it! 🙂 Interesting post Rommel. I learn something everyday, it seems. Hi Publisher. You never heard of Gelato!!?? Gelato is becoming a name for ice cream to a lot of places, country. 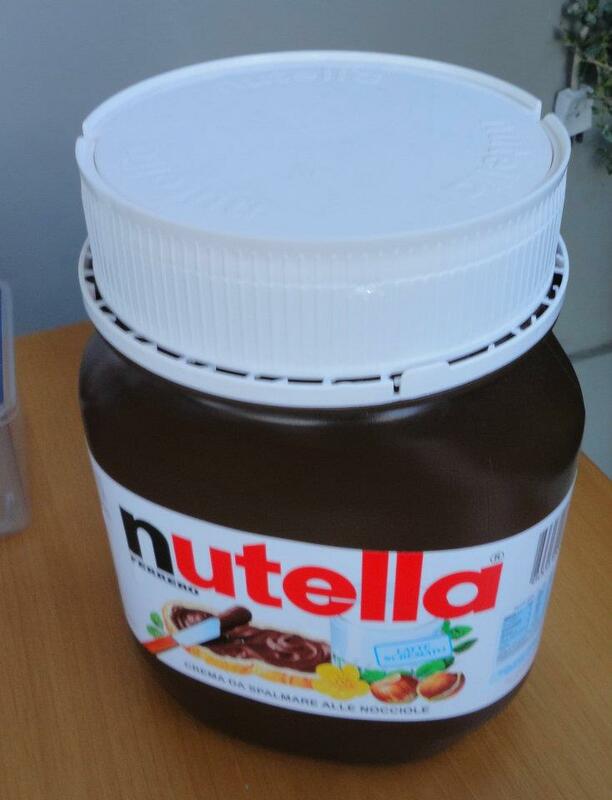 Like a breath of fresh air from la mia famiglia…I love all of the Italian foods you mentioned, and in my family Nutella is a necessity. A good cappuccino is strong enough to curl your hair if it is straight, and leaves a typical American gasping for breath. My Dad calls it “mud” but it’s SO delicious. My Mom is from Trieste; I lived a summer in Firenze and loved every minute of it. Everyone should go to Italy at least once, and live as the Italians do. If you do, you come away changed forever. What a fabulous culture! Thank you for a lovely post that made me miss my family in Italy. Mille grazie! Oh hey! I know Karina. I so miss Italy. Firenze!!! I love the snow decorating the roads. I was in Napoli. Nutella is an obvious mention. BTW, you comment is one of the best comments this blog ever received. For me a real Italian pizza must also have a thin crispy base and only a small amount of crust. Thanks for the visit, laz. Thank you for mentioning my blog, that is very kid of you. 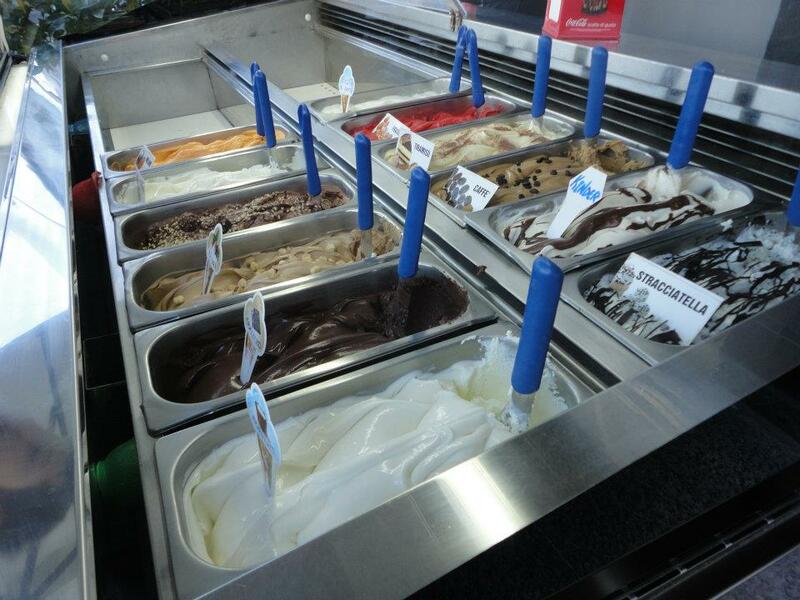 I have devoted a couple of posts to gelato. The one called Gelato anyone? explains the difference between ice cream and gelato, and there is a difference. It is difficult to eat ice cream anywhere else after eating it in Italy. Hi again Featured Blog Debra. Thanks for commenting again. I read that post already :D.
True. For a year now back in US, I haven’t eaten a cone of ice cream from an ice cream store. I did have those from supermarket once in a blue moon. That’s just something in a fridge. I put you on my blogroll btw. It’s a delicious post Rommel. 🙂 Great photographs of these foods. I never tried Italian food before. Now I will have to try it. Thanks! I hope you have a good one. Buon appetito! Great post Rommel – info and pics! I love all sorts of food. That picture of the pizza has made me so hungry I’m now going to go and have breakfast! The pizza is oddly formed, but still looks deli. Urg! I’m licking away with my memories of it. I wanna go back!!!!! I don’t know, but it is widely used in Italy. That paragraph is mostly link to European influences anyways… Kebab, cheese and Nutella. Artichoke is definitely not just in Italy but they make a big deal out of it, decorating and adding flavors and sauces, than I’ve seen anywhere else. You have just been nominated for the 7 x 7 award … this is an interesting award for an interesting blog. Please enjoy and post with pride. Feel free to pick up the link when time allows. Now I want to eat EVERYTHING in this post, in one sitting! Were you one of those who voted for me to post this? Weee! I got a like from an anchor. 😀 Thanks for the like, Carri. Wonderful post, Rommel, though it’s bound to ruin someone’s diet, haha. Oh yes! I wanted to mention seafoods but held off because it’s universal. Oh… stop the internet! That pizza, I WANT THAT PIZZA!!!!!! Bwahahaha stop the internet… Excuse me I had to laugh on the comment. Whahahahaha @ stop the internet! I just had to laugh too! Philippines is a great place to travel! Sorry, that’s the word I gathered from the owner of the place I had it. Thanks for clarification and the suggestion. Thank you for visiting my blog as well.